premiering June 27th, Saturday Night at 9PM/8c. Storyline via Hallmark: Before his wedding to his movie star fiancé, country music sensation Bradley Sutton (Metcalfe) visits his rural hometown to sell his family’s former house. After reconnecting with his old friend... click here to read more! For all of you Hallmark Christmas Movie fans... you'll immediately recognize Autumn Reeser as Emily Jones in "Love at the Thanksgiving Parade". And, speaking of Christmas, Christmas in July begins next weekend on the Hallmark Channel!!! So... stay tuned!!! Enjoy this last weekend in June, Everyone! click here to catch the encore airings. I won't be missin' this one, Net! !......love those country/cowboy themes!! Looks like Autumn's got another "looker" for a leading man and I'm so glad Hallmark has recognized her great acting abilities. I just finished watching "A Country Wedding", Net, and our girl did not disappoint!! I saw that "little thing" between Autumn and Jesse just like with her and Antonio. She also remarked she likes making Hallmark movies and is looking forward to making more!! Yahoo!! Hi Linda, I totally agree about Autumn and Jesse's chemistry, "little thing", it's right on par with Autumn's chemistry. Wouldn't mind a few years down the road of her and Jesse doing another movie together. I wouldn't even mind another movie with Autumn and Antonio. Loved A Country Wedding, wonderful story and I'm always a sucker for a country themed movie. Autumn and Jesse had great chemistry. Autumn's Hallmark movies are always a must see for me. Another winner in my book. LOVED it!!! I've already watched it twice and will record it tonight when it comes on at 9 PM. Autumn and Jesse have great chemistry and I just loved the storyline from start to finish. I never got bored or wanted to change the channel. They're both cuties!! Loved the movie! Will another one be made telling about their life together after marriage? Hope so!! I adore this movie,too, Pat! 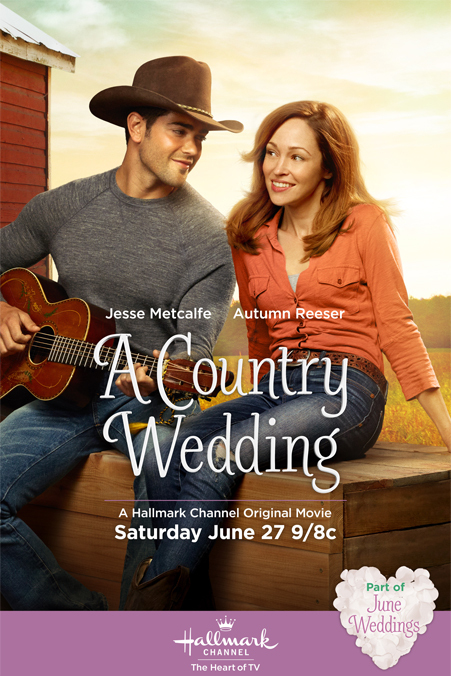 "A Country Wedding" is in the class of Hallmark's very best... ideal casting, breathtaking scenery, fantastic music, a fun story, plus... a sweet little charming romance and happy ending! Even though they've already said "I do!," I would still love to see a sequel! Is it possible? Sure. Is it likely? Well, that's anyone's guess. I'm sure there's plenty of potential conflict that could make the story work. At this time, however, I have not heard of any plans to sequel this story, but I'm sure fans would love it just as much as "All of My Heart 2!"